This unit has 4.5 miles of paved trail, much of which is considered wheelchair accessible. 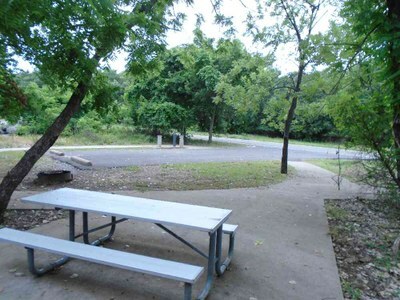 The 2.8 mile Randy Bell Scenic Trail is a wheelchair-accessible concrete trail that is great for families of all ages; you can get on this trail from nearly any camping loop in this unit and see much of the park. The Unit’s headquarters and all park restrooms, except those in the Wild Plum camping loop, are wheelchair accessible, with cement routes from the parking area. The two group pavilions have great lake views and are wheelchair accessible with a cement route from the parking area to the sites and the wheelchair accessible restrooms. Group Pavilion 1 is closest to the boat ramp, and is near the swimming area. Group Pavilion 2 is at the north end of the Day Use Area. This entire area has cement routes to many of the picnic sites and along the swimming beach. The boat ramp in this area is also wheelchair accessible. Campsite 6, 7, and 16 in the Hawthorn Camping Area have a cement route from the parking area to the site and the wheelchair accessible restrooms. Campsites with 50-amp Electricity 51 in the Deer Ridge Camping Area and 148 in the Quail Run Camping Area, and Isle du bois Campsites with 30-amp Electricity 71, 75, and 100, in the Deer Ridge Camping Area, and 132, 161, and 170 in the Quail Run Camping Area, are wheelchair accessible, with cement routes from the driveway to the site. In the Bluestem Grove Equestrian Area, campsites 171 and 184 are wheelchair accessible with cement routes to the site and the wheelchair accessible restrooms. The 2.8 mile Concrete Trail is a wheelchair-accessible concrete trail that allows you to see much of the park, and passes through the day use area and the Walnut and Juniper Cove Camping Areas. The two group pavilions are wheelchair accessible with a cement route from the parking area to the sites and the wheelchair accessible restrooms. Johnson Branch Campsites with 30-amp Electricity 01 in the Juniper Cove Camping Area and campsite 40 in the Walnut Camping Area, are wheelchair accessible.. The Lone Star Lodge Resort in the Jordan Branch Unit is wheelchair accessible and has great views of the 30,000 acre lake. There is a wheelchair accessible cement trail from the lodge to the lake. Go to the Lone Star Lodge and Marina website for more information.